Not only did this book promise to be a terrifying collection of horror and thrillers, but it also had stories by some of my all-time favorite authors! It should be a surprise that I HAD to have Slasher Girls and Monster Boys as soon as it was released. Oddly, I didn't blow through this anthology like I'd expected to. I had to take it one story at a time over several weeks. I have to say, although some of the stories included were interesting, they did not live up to the promise of the synopsis or the terrifying cover (honestly, I had to take the cover off so I didn't have to look at it). One thing I hadn't realized was that these stories are all retellings of old horror movies or books. This was actually a really cool idea! Unfortunately, it didn't quite work for a few of them. The connections were either weak or made the stories predictable. And a lot, a LOT, of these stories have to do with abuse, as if that were the same as horror. Of all of the stories included, In the Forest Dark and Deep by Carrie Ryan was my absolute favorite, but certainly not because it was scary. In fact, it was kind of the opposite... While the Hare might have been a little unnerving, the story actually gave me the warm fuzzies and I was dying to read more! Other favorites were Sleepless by Jay Kristoff and The Flicker, The Fingers, The Beat, The Sigh by April Genevieve Tucholke. Neither of them was especially terrifying, but the former did creep me out and kept me guessing, while the latter was written in the lyrical prose I've come to love from this author. While none of the stories included were terrible, none of them were terrifying either. 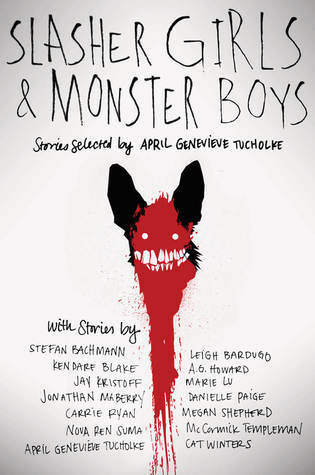 Most of the selections for this anthology were pretty good, just not as horror, and that's what I was hoping to find in a horror anthology with a terrifying creature on the cover.